Whichwood delights in the most elegant and unexpected ways. There are a lot of reasons I keep books on my shelves, schlepping them each year when I inevitably move. Like an avid reader, a lot of these books are TBR. Some remain because of the author. Some I didn’t enjoy reading but know I can learn from as a writer. Then, there are the books that feel like old friends, ready to share my sadness or joy, books that make a place feel more like home for their presence on the shelf. These books aren’t necessarily the best of their kind, but they’ve made me feel something special. I’m happy to add Whichwood by Tahereh Mafi to that shelf. Thirteen-year-old Laylee is mature long beyond her years. She had to grow up fast after the death of her mother sent her father wandering in search of Death, leaving Laylee the only mordeshoor of the magical Whichwood. Laylee’s family magic relates to the dead—she must wash and package them for the next life. Now, Laylee likes her job, but scrubbing the ever-growing stack of bodies for no pay and with no breaks is too much for anyone, let alone an orphaned child. She loves her ghosts, but there is only so much she can do. Enter Oliver and Alice, children from a neighboring magical land. Alice has been assigned to help Laylee using her special brand of magic: color. Yet, they soon learn not everything can be solved by magic. This novel has so much to love. 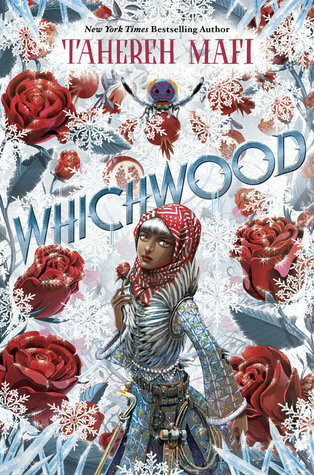 A delightful narrator that reminds me of Death from The Book Thief by Markus Zusak; a sensitivity to death and childhood reminiscent of Neil Gaiman’s The Graveyard Book; a delightful atmosphere of magical realism that nods at One Hundred Years of Solitude by Gabriel García Márquez—and yet, it’s still all Tahereh Mafi’s voice and world and sense of wonder. As young adult literature goes, this novel hovers between middle grade and YA. Don’t let that fool you—there’s plenty for even an adult reader to enjoy, but teenagers and pre-teens who like the creeper elements of a writer like Gaiman will find this book a good fit. I don’t want to spoil too much, but I will point out Mafi’s deft handling of young love and parents. First, two main characters, Benyamin and Oliver, each become interested in the female characters, Alice and Laylee. Oliver likes Laylee but while honoring the fact that fourteen-year-olds do have crushes and romances, Mafi doesn’t focus the story on this element. It doesn’t break up the friendships between the main characters or cause lasting strife of any kind, and Oliver is respectful of Laylee’s wishes. Instead, it is shown as a seed that will later blossom into love when Oliver and Laylee are around eighteen, as the narrator informs the reader. Second, adults. Those of you who have read my earlier reviews know a pet peeve of mine is the lack of adults in a YA story. It feels so untrue to a young person’s life that YA books without adult characters often seem shallow to me. Whichwood has a nice balance of adults active in the story and on the sideline, particularly in the character of Benyamin’s mother, Madarjoon. She aids the children without overshadowing them and also becomes something of a found mother for Oliver, Alice, and Laylee. Even with the parents playing key roles in the text, Mafi’s main point still shines clear: the maturity of children. Throughout the story, the children are shown to be capable, thoughtful, kind, and aware of their shortcomings while celebrating each other’s strengths. They understand hardship and exhibit empathy when many of the adults do not. In light of current politics, a novel that encourages respect and listening to children is a welcome read. Bonuses: +1 for footnotes. Who doesn’t like footnotes? Penalties: -1 for slowing down the story to mention incidents from the previous book, Furthermore, which this novel sort of acts as a sequel to. Nerd Coefficient: 9/10* “Very high quality/standout in its category.” Read more about our scoring system here. *Honestly, I’d give this novel 10/10, but I do realize some books come to readers at the right time and that might not be the case for everyone. Whichwood landed in my hands when I was ripe for reading it. I hope that will be your experience, too.